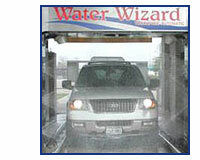 Easy to read Pay Stations: Making it easy to complete your transaction or purchase discounted wash packages. Contouring Wash Boom: Ensures optimal distance for the oscillating nozzles to rotate and attack the dirt on the front, top, & rear of the vehicle. Come try the Wash Wizard's state-of-the-art self serve bays that conveniently accept multiple payments options for fast checkout. CREDIT CARD TIMERS: Single card swipe activates the services for as long as you need to wash.
BILL ACCEPTANCE / BILL BREAKER: Use cash, quarters, WashCard, or credit card to pay for your wash, vacuum, or vending products. 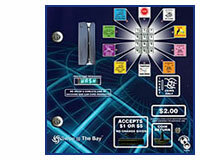 IN-BAY AUDIO: Provides easy to follow instructions to guide you through the use of a credit card or cash. The audio also helps you keep track of the current wash function and the amount of time remaining. Additional Car Care Products from Armor All® are available in our Vending Area to clean and protect your vehicle inside and out!